YOUR BEST SOURCE FOR PRO AUDIO GEAR. 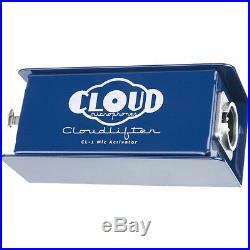 Cloud Microphones CL-1 Cloudlifter 1-Ch Dynamic Ribbon Mic Activator Preamp. Cloud Microphones CL-1 Cloudlifter 1-Channel Mic Activator. Active Gain for Dynamics and Ribbons. It's all about gain and impedance. While some of the best sounding microphones out there are low-output dynamics and ribbons, pre-amplification can be challenging due to the gain and impedance requirements. Cloudlifters address this by giving passive microphone signals a major inline boost -up to +25db of ultra-clean gain- while properly loading the microphones' transformer for optimal performance. The Cloudlifter® CL-1 is completely self contained, driven only by the phantom power from your mixer or preamp. Ideal for dynamics and ribbons alike, the CL-1 turns phantom power into the extra gain required for using passive microphones. The immediate dose of extra gain can make even a budget microphone/preamp combination sound clean and professional. For broadcasting and live sound, the active output signal of the CL-1 can prevent added noise over long cable runs. With endless uses, Cloudlifters are quickly becoming a standard workhorse solution for audio and broadcast professionals. A Must-Have Tool for Dynamics and Ribbons! Cloudlifter CL-1 Mic Activator is an easy to use, compact solution for common audio problems faced in the field and in the studio. Designed for all passive microphones - including ribbons- the CL-1 safely uses any standard phantom powered microphone input device to provide up to +25db of ultraclean, transparent gain. Cloudlifters dramatically improve the performance of passive microphone signals by driving stronger, cleaner signals over longer XLR cable runs, making them ideal for broadcast, live, and studio applications. Enclosed in a rugged steel enclosure offering excellent shielding, the CL-1 additionally has provisions for stage or stand mounting with the included strap. Using patent pending technology that keeps the direct audio path free-andclear of transformers, capacitors, and resistors, the CL-1 houses discrete JFET circuitry that delivers world class, ultra-clean gain while preserving the natural sonic characteristics of the source. Cloudlifters are recommended for improving the signal to noise ratio and performance of passive microphone/preamp combinations with the following. Recording direct into a DAW interface. Noisy or low gain preamps. Mixers/preamps that negatively impact the sound at higher gain setting. Miking softer sound sources such as acoustic instruments and voice. Gives passive mics up to +25dB additional active output. Provides 2 distinct stages of ultra-clean gain. Easy to use self contained design requires only phantom power. Recommended for use with all passive dynamic microphones. Compatible with tube, battery, or power supply driven microphones. Safe for all passive ribbons with no transfer of phantom. Utilizes Patent Pending Class A, Discrete JFET circuitry. Rugged, road ready and portable, for studio, stage and broadcasting. Handcrafted entirely in the USA. The item "Cloud Microphones CL-1 Cloudlifter 1-Ch Dynamic Ribbon Mic Activator Preamp" is in sale since Monday, March 06, 2017. This item is in the category "Musical Instruments & Gear\Pro Audio Equipment\Preamps & Channel Strips". The seller is "*pitbullaudio*" and is located in National City, California. This item can be shipped worldwide.